Rapid,Successive Determination of Ni,Cu in Raw Ore and Tailings by AAS Ren Huiping;Yang Jing;Zhang Xukun;DUAN Aixia;Jinchuan Group Co. Improvement of antimony white with oxidized pan WANG Pei;CHANG Heng-bin;ZHANG Wen-jie;Henan yuguang metallurgical machinery manufacturing co. Different carbon alkali clinker dissolution,Subsidence experimental study FENG Cheng-zhi;Zhongzhou Branch China Aluminium Co. Using magnesia new material to solve the high sulfur coke tank corrosion of tank furnace technologies Zhang Heng-hai;Yuan Zheng-he;Gao Ying-dong;Chong Shi-xiang;Shi Cong-xing;Chen Fei-fei;Shanghai constant foreign instrument & Technology Co.
Yunnan copper ore flotation experiment research HUANG Dong-mei;LIU Peng;Shandong Humon Smelting Co.
Φ900×1350mm for reversible two-high hydraulic hot mill group of high-precision copper plate & strip XU Yan-ping;CHE Yan-ming;REN Hui-fang;Guangdong G·B technology co. 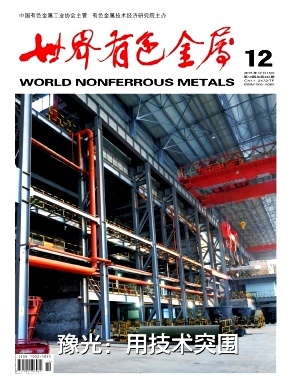 Determination of oxygen and nitrogen in iron and steel materials LIU Wen-jiu;Hanzhoung iron and Steel Co. Discussion on the application of new energy saving technologies of heat treatment of metallic materials YOU Fang-min;Changde Tobacco Machinery Co. The Equipment and Industrial Application of Double Bottom-Blowing Continuous Copper Smelting Technology ZHAO Ti-mao;WU Yan-xin;Henan YuGuang Gold & Lead Co.
Technology idea on treatment of leaching residue of zinc hydrometallurgy by bottom-blown furnace YANG Ming;Henan YuGuang Gold & Lead Co.
Summary of China's cobalt Hydrometallurgy industry wastewater treatment DU Chang-fu;WU Yi-gen;KLK Jiangsu Cobalt Nicket Metal CO.
Steel structure construction cost of the metal cost and quality analysis of the relationship FENG Lei;Construction group co. The general review of Zambia mining investment legal system ZHANG Yuan;KONG Ling;BAI Jue;HU Xiao-li;University of Science and Technology Beijing;Sinomine Resource Exploration Co.